Charles Hamilton has been a Managing Director of KRG Capital since 1999, and has over 40 years of experience in the fields of investment research, investment banking and private equity management. Hamilton has served as a member of the Firm’s Investment Committee since 1999, and as a lead Managing Director, Chairman and member of the Board of Directors for a number of its portfolio companies. 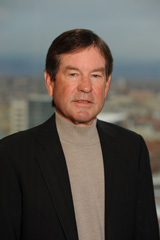 Prior to joining KRG Capital, Hamilton served as a Managing Director of First Analysis Corporation (“First Analysis”), a Chicago-based investment research and investment management firm, and was also a Managing Director of Robertson, Stephens & Co. and a successor entity, RS Investment Management, for over 18 years. Previously, Hamilton was responsible for a joint-venture private equity fund management arrangement between Robertson, Stephens and First Analysis. Hamilton holds a Bachelor of Science degree in finance from the University of California, Berkeley.